Up Shuttlethread Pass is the sixth level of World 5 in Yoshi's Woolly World. The level starts with some snaking platforms. Yoshi must fall down to the Flipper below to make it to a door leading to the other side, then follow the path up and eat the edible wall. After exiting through the door all the way to the right and exiting back to the beginning, Yoshi will cross some Hook Guys, and must enter the next door encountered. After approaching a Miss Cluck, Yoshi must defeat it, then hit a Winged Cloud directly above it to bounce on a spring ball and jump up and over to the right, where the first checkpoint awaits. Yoshi must then move to the left, enter the door, and follow the next snaking platform. Yoshi must then get off of it immediately after it forms a staircase, then follow the next snaking platforms to another door. Yoshi must then hit a hidden Winged Cloud directly above a Flipper to reveal a path to another door across the Flippers, then enter that door and high jump on a spring ball. He must then head to the left to enter a door above a Snoot, and follow a series of Miss Clucks to the second checkpoint. After moving left, Yoshi must follow a series of alternating snaking platforms upward to some Snoots, then head left to defeat a Snoot and enter another door, followed by another. Yoshi must then cross the path of the more snaking platforms and enter the door at the end. He will end up in a room with many Peeplys. Afterwards, Yoshi will cross one final gauntlet of snaking platforms, followed by two Snoots and a spring ball leading directly to the goal roulette. Smiley Flower 1: To the left of the first Miss Cluck. 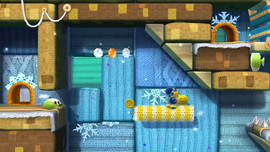 Smiley Flower 2: While following the snaking platform after the first checkpoint, instead of continuing to follow it, Yoshi can fill in a platform via yarn ball on the top right, then enter the door next to the platform and follow the Flippers right to the Smiley Flower. Yoshi must then head left and return to the snaking platforms. Smiley Flower 3: In a hidden Winged Cloud above the second Miss Cluck through the door just above the first Snoot. Smiley Flower 4: In a Winged Cloud in an edible wall with Peeplys. Smiley Flower 5: In a Winged Cloud just after the room with many Peeplys. Wonder Wool 1: Unveiled after hitting a Winged Cloud directly above the first snaking platforms. Wonder Wool 2: In a hidden Winged Cloud up and to the left of the platform immediately after the staircase formed by the snaking platform after the first checkpoint. Wonder Wool 3: Through a Flipper in the path of a snaking platform following after the first checkpoint. 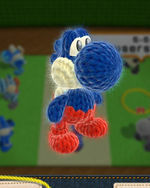 Wonder Wool 4: Immediately after the second checkpoint, Yoshi must throw a yarn ball at a hidden Winged Cloud orbited by snaking platforms directly above to reveal a spring ball, then jump on the spring ball to reach the snaking platforms and, in turn, reach the Wonder Wool. Wonder Wool 5: Yoshi must defeat all Peeplys in the room with semi-solid platforms and hidden Winged Clouds to get the Wonder Wool. Collecting all of the Wonder Wools knits Trousers Yoshi back together. This page was last edited on March 20, 2019, at 19:01.